She is the Springville Songbird; a regional treasure. Her roots are gospel, her home is in the country, but her versatility ranges wide, and her repertoire is immense. Ask for an old song and she sings it to you like youve loved it forever, like youre hearing it for the first time. Then shell play you a new one youll love even more. 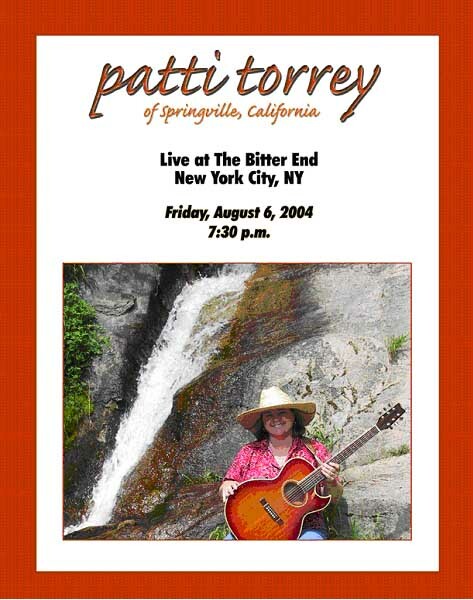 From plaintive cowboy ballads to pop standards, through rock and roll to jazz, Patti can sing it all. The Bitter End: the great nightclub in New Yorks legendary Greenwich Village. Folk-music, Folk-rock, Blues, Jazz and Country, Rock and Roll, Soul Music, Show Tunes, Satire and Comedy. The club opened in 1961, 43 years on Bleeker Street, showing the best entertainment America has to offer. Everyone from Bob Dylan to Etta James, from Jay Leno to Soupy Sales, from Judy Collins to Neil Young has performed in front of the famous brick wall on the stage of The Bitter End. Now they get Patti.